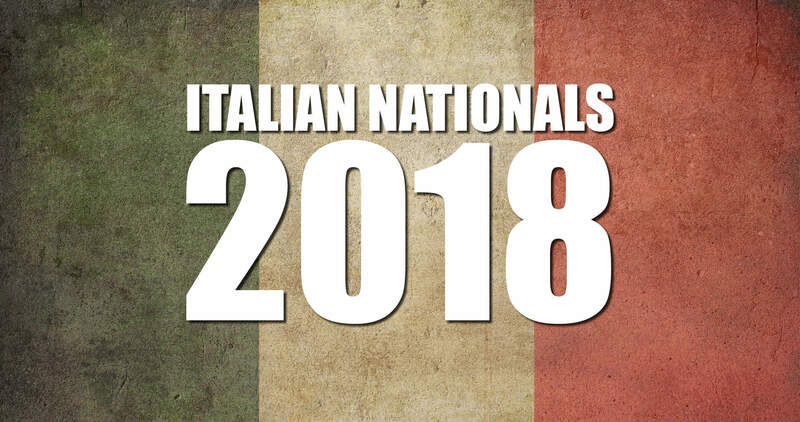 This is our preliminary report from the Italian Nationals, and we'll be posting a more detailed report as we get more information in. Following a bunch of Nationals over the last 4 weeks or so the meta wasn't expected to change a whole lot for the Italian Nationals taking place in Bologna. 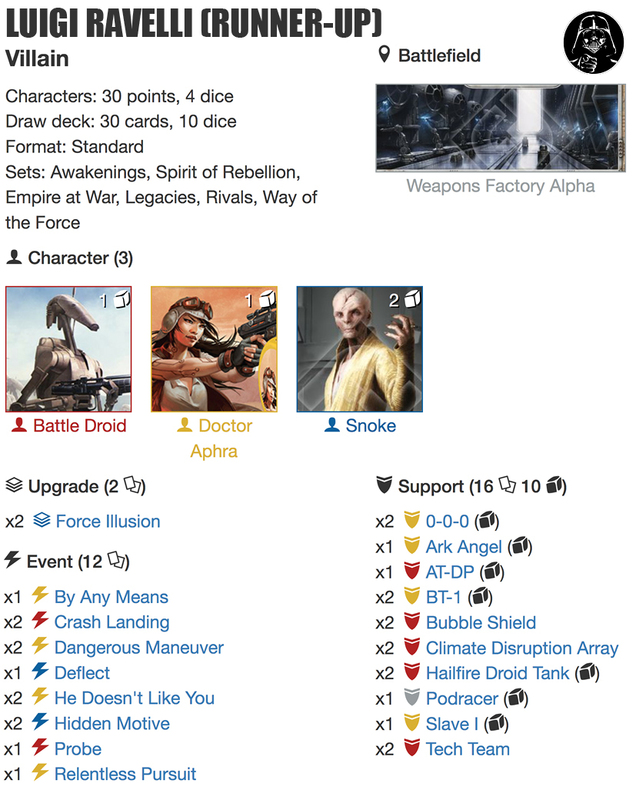 Most people anticipated the powerful Snoke vehicle decks to make yet another strong showing, just as most players probably felt that Franck E.'s Nationals victory in Belgium were more down to the talent of a great player than an apt description of the strength of the deck he took down the final with. 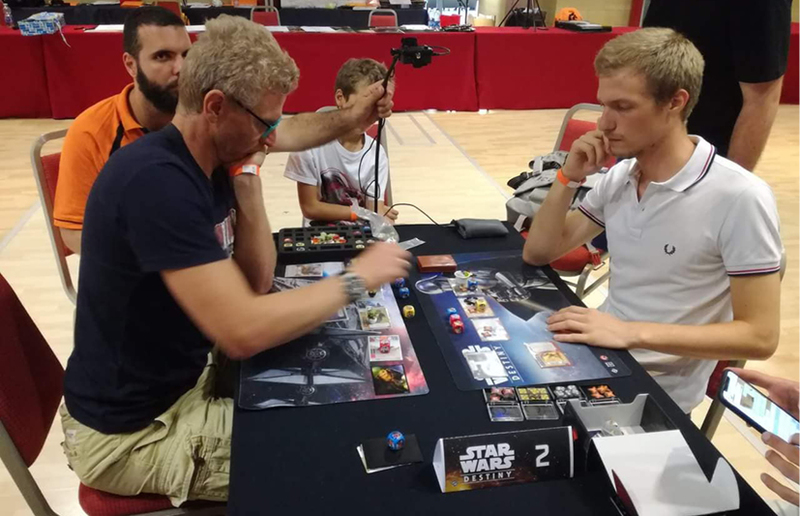 64 players battled it out for 6 Swiss Rounds and a top8 Cut, which makes it the second largest Nationals event in Europe so far ... and you guessed it ... Snoke did it again! The final ended up being a mirror match between the eSnoke/Aphra/Battle Droid, and it's getting harder and harder to argue against the possible Balance of the Force of the Supreme Leader. 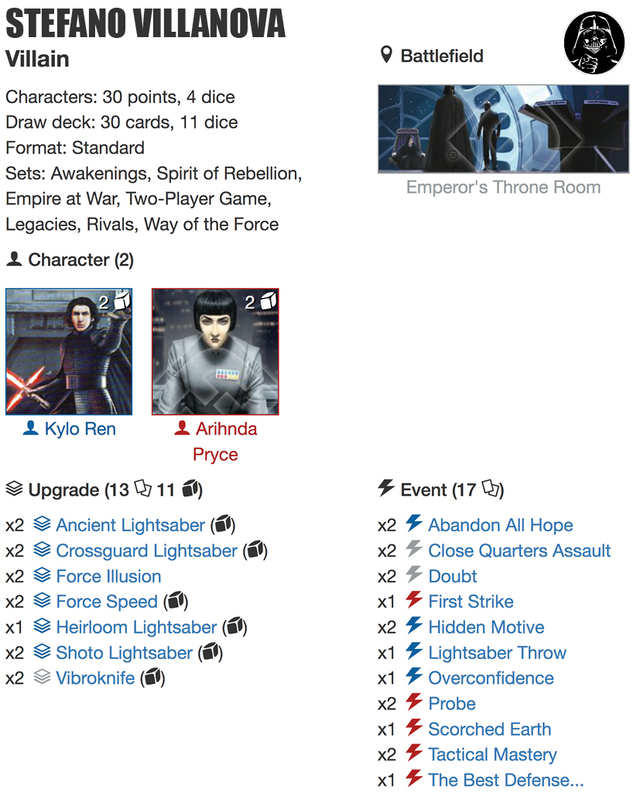 Stefano Villanova brought Kylo2/Pryce, and although it's a great character pairing which regularly makes a showing in the top cut at most tournaments (including the various National events), we've also grown accustomed to it just not being able to make it all the way through. It's powerful, but too fair! Sure, it brings along a few tricks, but as much as the Tactical Mastery plays as well as the Force Speeds can be exactly what you need to close out games, at the end of the day it just feels too unreliable. While most of the list looks pretty stock, Stefano obviously did tech hard against his most likely archetype of the day: Vehicle decks, and some of the additions probably did take some of his opponent's by surprise! 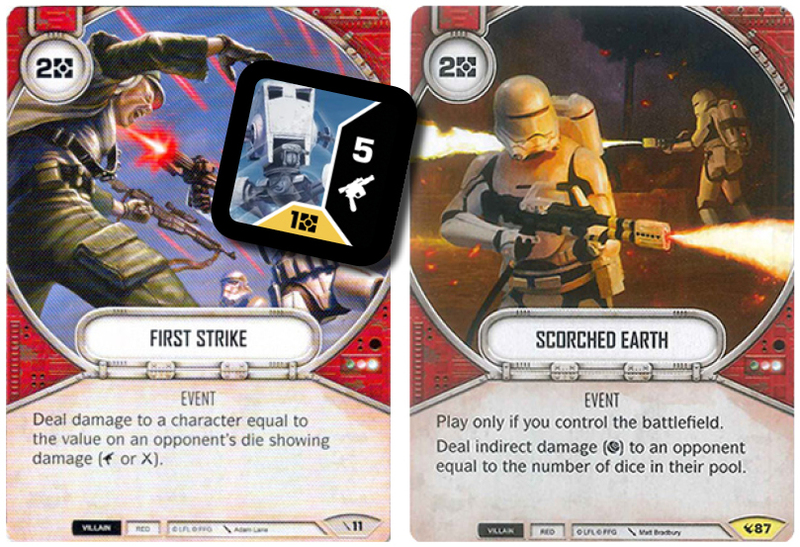 Being able to send 5 damage straight into an opponent's character courtesy of his 5 Ranged Damage showing on an AT-ST die is extremely satisfying, and while the cost of the card is pretty steep the reward can be as well! I'm honestly surprised not to see Deflect in place of FIRST STRIKE, but I guess the Spot Blue requirement was too prohibitive for Stefano. SCORCHED EARTH is another anti-vehicle tech card. 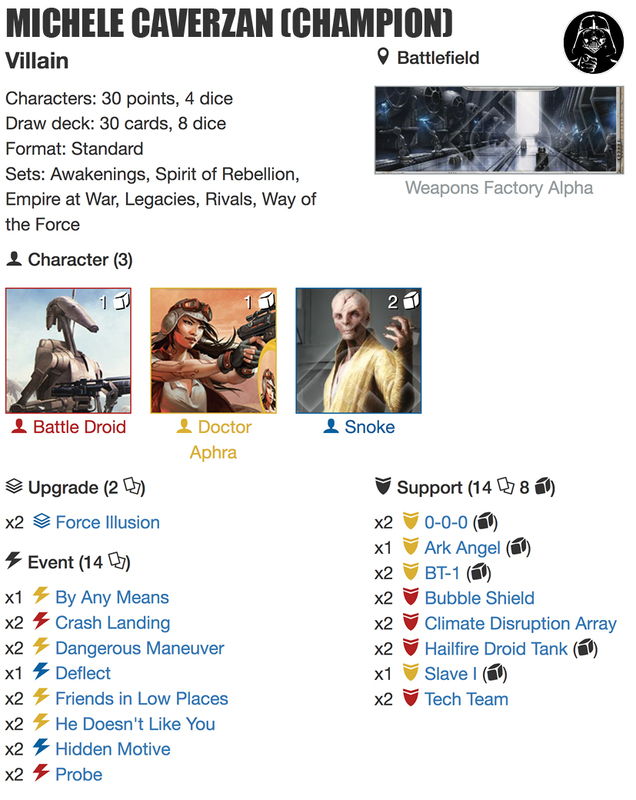 It saw some play in the early days of the Legacies meta when Tarkin/Seventh were around, but it's been out of the loop for a while. 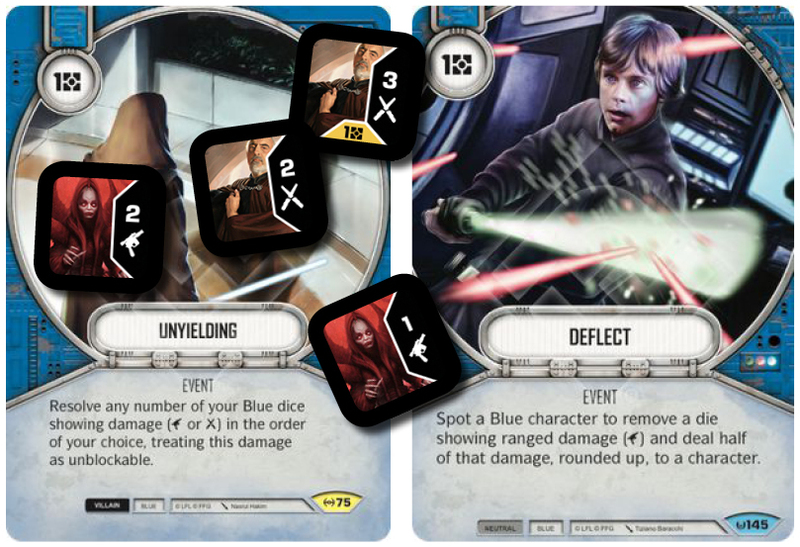 It's a great card against those instances where your opponent has amassed a fleet of supports, and just need all the dice in the pool to maximise damage output with Snoke Focuses. You only make that mistake once! 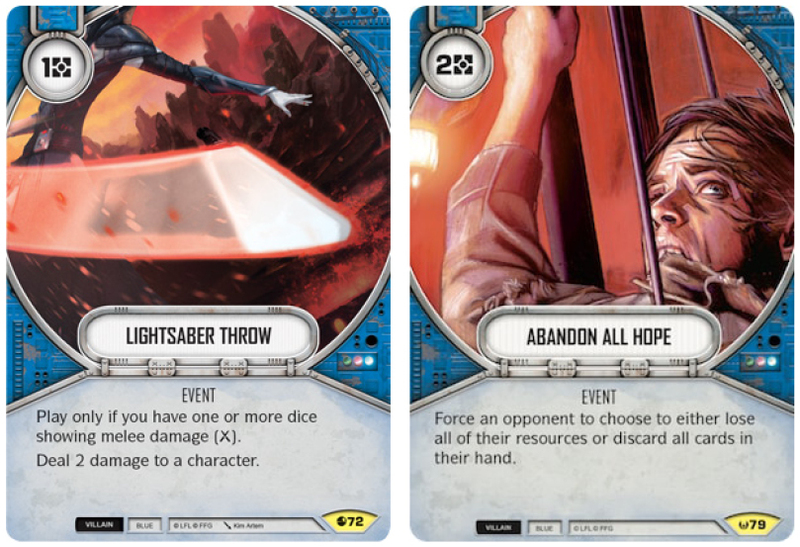 LIGHTSABER THROW is added for some nice surprise out of hand damage while ABANDON ALL HOPE can really destroy an opponent's turn when he's finally hoarded his 200 resources and now realises that he'll be losing it all. With Abandon All Hope floating around, I'm betting that Snoke players will start considering their sequencing more carefully! We talked about the potential rise of Talzin/Dooku, considering the meta, in our YOUR Destiny Podcast Episode 21, and TOM REED's list is very similar, barring a few cards, to the list that Nick Cuenca from theHyperloops took to top4 at US Nationals 2018. Talzin and Dooku form a hard hitting and super consistent duo that can wreck some serious face, and although it doesn't pack a lot of surprises, the few it has are really great, including the meta inspired DEFLECT, and UNYIELDING which allows you to not only resolve your blue mixed damage sides, but making them unblockable in the process, which then frees the slot where Frighten used to sit - sweet! 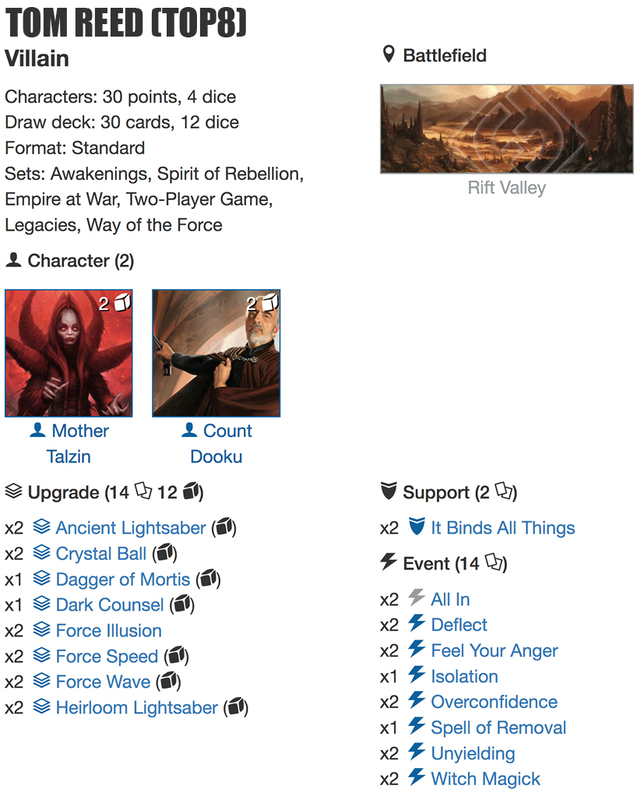 Rift Valley as described by Nick Cuenca in his NOVA 2018 write-up is straight up bonkers in this deck! 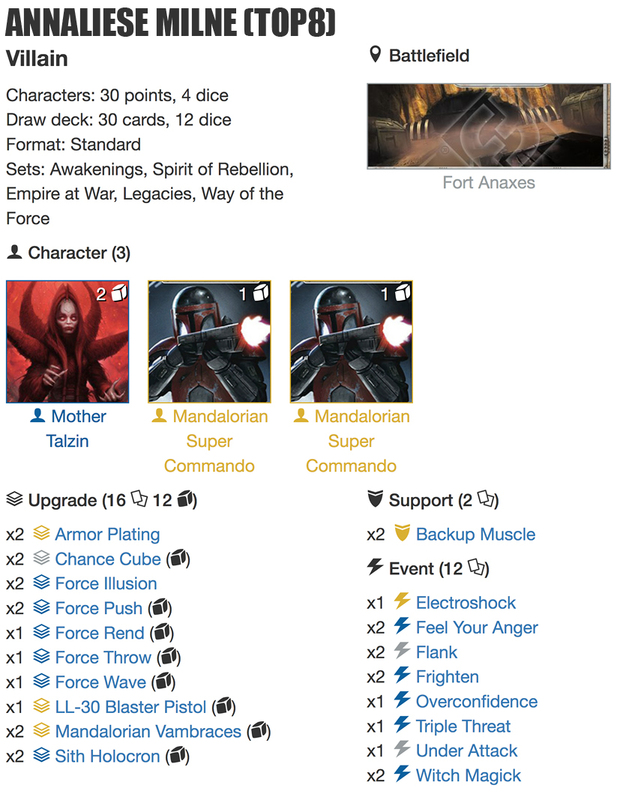 The deck runs 4 even cards, FORCE SPEED and ANCIENT LIGHTSABER, which is exactly the number Talzin is looking for. 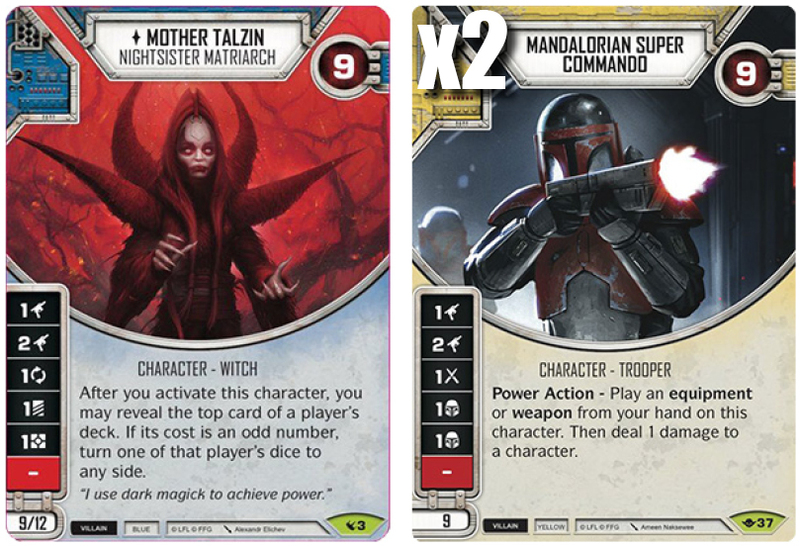 Hard mulliganing for two of those 4 cards does make Talzin's ability as well as the WITCH MAGICKS quite reliable! 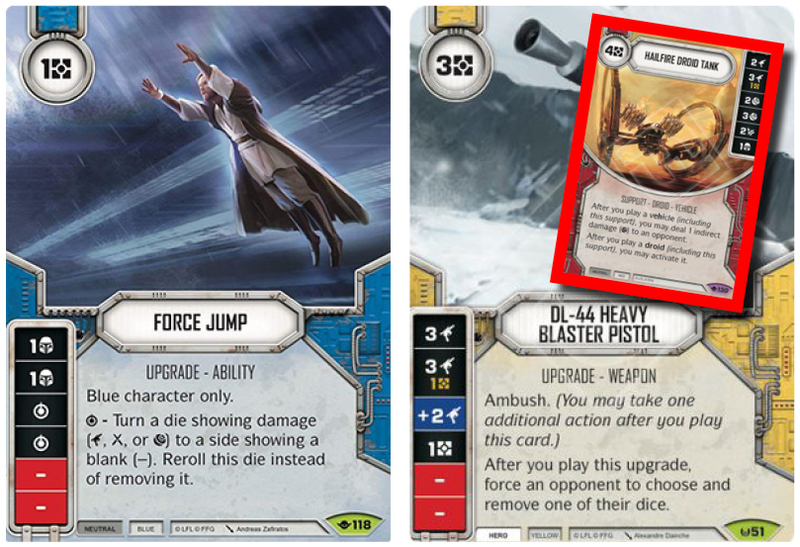 I'm sure we'll see more players trying to adapt their aggro decks to the meta and I'm confident we'll see Dooku/Talzin spearheading those efforts. This is the list, card by card, that Jordan McClure used to take 2nd place at the North American Championship 2018 (read his Tournament Report here), and the character team recently took another 2nd place at the German Nationals 2018, piloted by Tobias Winter from the YOUR Destiny crew, as well as 1st place at the Russian Nationals 2018 in the hands of Kirill Marychev. It does say something about the undeniable quality of the deck. The deck is designed to combat all comers, slow and steadily wearing them down, but can be sweetened up by a few tech cards. I do miss the Deflects as well as a Vandalize or Rend to take care of the Chance Cubes that are bound to be afloat. Killing 27hp worth of characters backed by WITCH MAGICKS and ARMOR PLATING can be a daunting task for anyone! 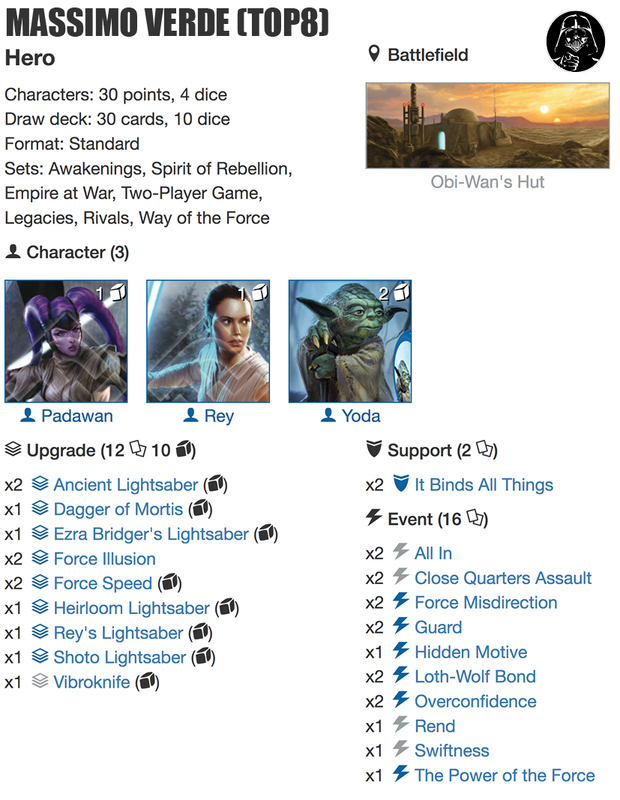 The surprise package of the top8 will in most people's mind be Massimo Verde's eYODA/REY1/PADAWAN deck, and for no good reason other than we like to be surprised - or at least act surprised. That blue heroes manages to put one deck amongst the best 8 decks in any major tournament shouldn't really be much of a surprise to anyone! The choice to add Rey1 rather than go for the Plo Koon/Padawans package is a smart one considering the meta, because it also means adding another +3hp, which is needed in an environment rife with big Indirect damage side. That Rey1 also comes with a bit of action cheating to protect the precious Melee sides is just an added bonus. The deck runs a super interesting upgrade package, from a perspective of consistency, with just 1 SHOTO LIGHTSABER and 1 VIBROKNIFE, but instead goes "all in" on redeployable upgrades. 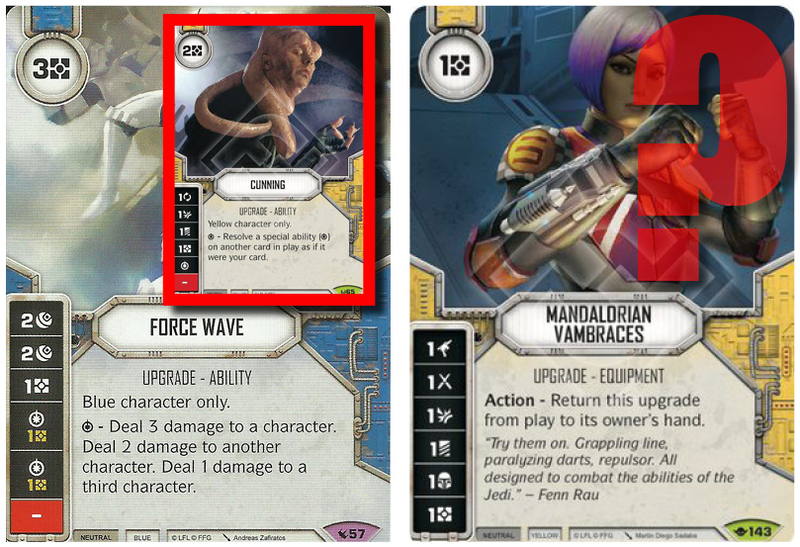 Plays like activate Yoda, then play Vibroknife on Rey, Loth-Wolf Bond to activate Rey and Padawan and either CLOSE QUARTERS ASSAULT the entire hand away or ALL IN to deal lethal to a character in one swift action. 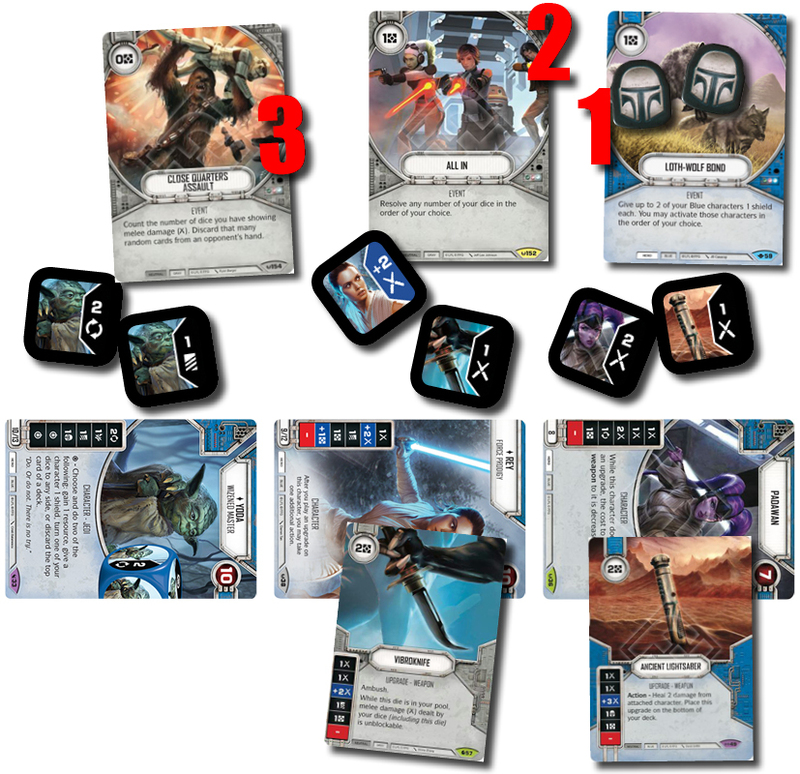 All of these plays are available because of the crazy design of Rey1, and some of them as early as round 1. Going that route of course does make the deck much more vulnerable though and I can appreciate why Massimo chose the safer avenue - even if playing fair is difficult in the current competitive meta. Both of the top4 decks that did not manage to make it into the final are very similar decks, gravitating around the same design template, although different character pairings. 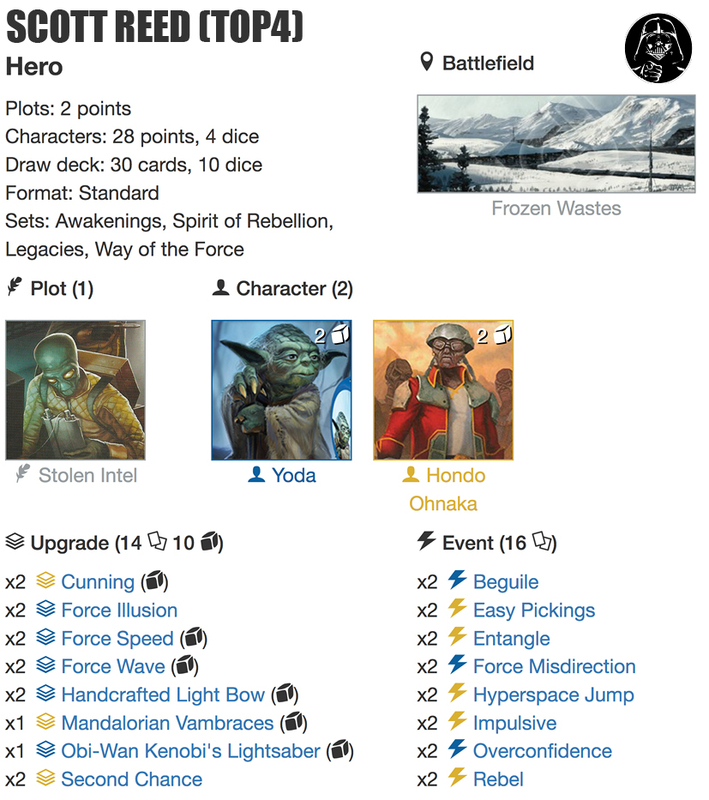 SCOTT REED'S Yoda/Hondo, which carries on the philosophy from Franck E.'s winning deck at Belgian Nationals 2018. The philosophy is as simple as it is effective. Get in, do damage and get out. Scott's deck sacrifices some of the resource efficiency from Double Dealing and instead includes a much more massive mitigation suite: 10 cards + 2 FORCE ILLUSION and 2 REBEL, which is an interesting choice in a meta where everyone seems to be cutting back on mitigation, but that might mostly have been due to the previous prevalence of mill decks, against whom you do NOT want to see too many mitigation cards. But the Millpocalypse has been cancelled - for now - which means that being able to remove dice is again great, and Scott Reed does have some of the best in the game at his disposal. 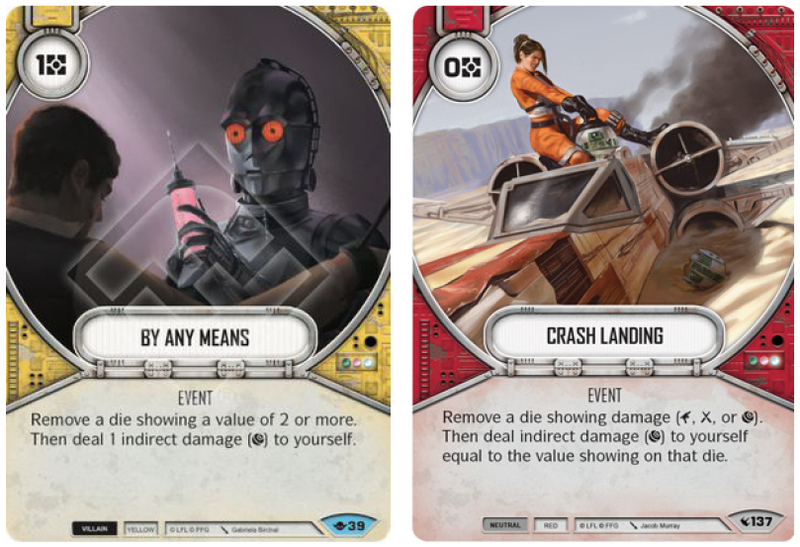 Remember that on top of the really cool synergies going on between CUNNING and the other upgrades in the deck, with the Special being able to emulate the effect of any other Special in the game, there are crazy possibilities to explore: Including using an AT-ST Special to destroy itself! 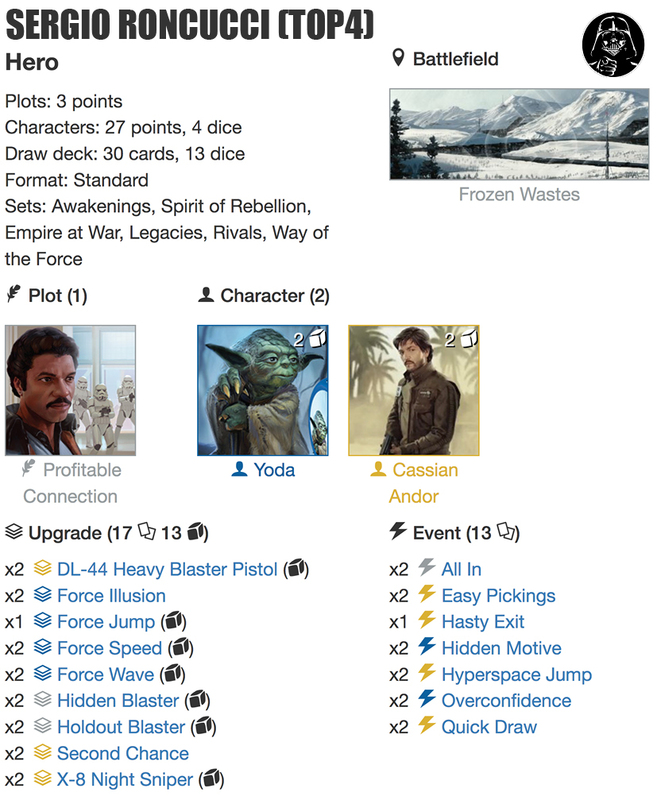 SERGIO RONCUCCI'S Yoda/Cassian deck is similar in play style and tactics to the previous list played by Scott Reed. It's incredibly effective, although slower than Yoda/Hondo (but that shouldn't really matter in the current meta), but packs are serious punch. 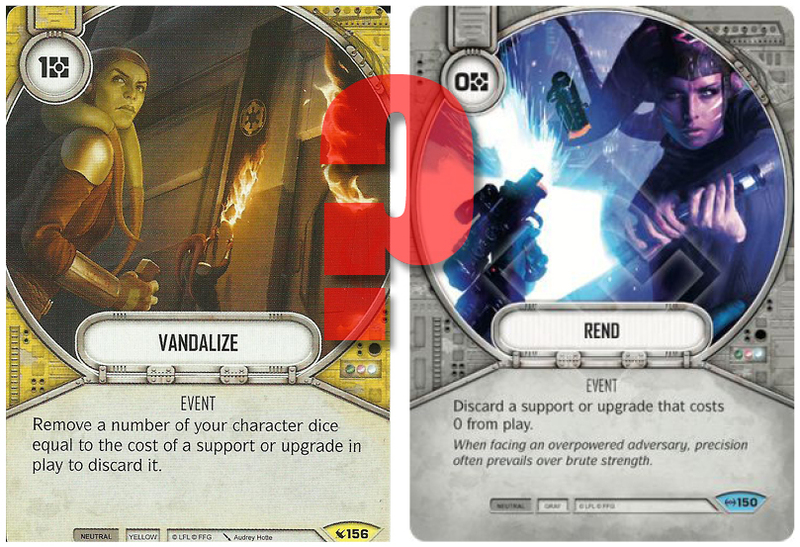 The Indirect damage from Cassian Andor's ability quickly stacks up! The upgrade package seems pretty stock although the single FORCE JUMP alongside the DL-44 HEAVY BLASTER PISTOL can be a cute tech against vehicle lists. 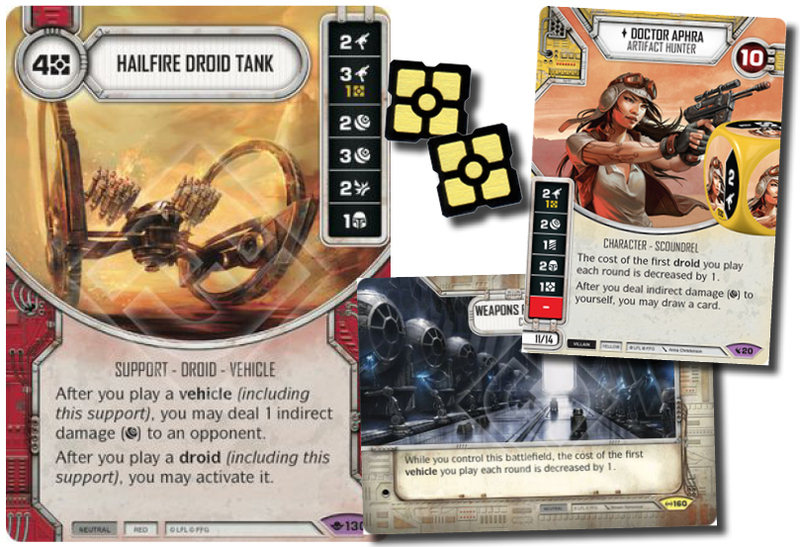 If an opponent decides to roll in a vehicle die first or plays a Hailfire Droid Tank and uses the ability to get the die in the pool, playing the DL-44 will make short work of it! It is in any instance free mitigation of a die, even if it is the worst die, and together with FROZEN WASTES will make for an efficient additional mitigation package! 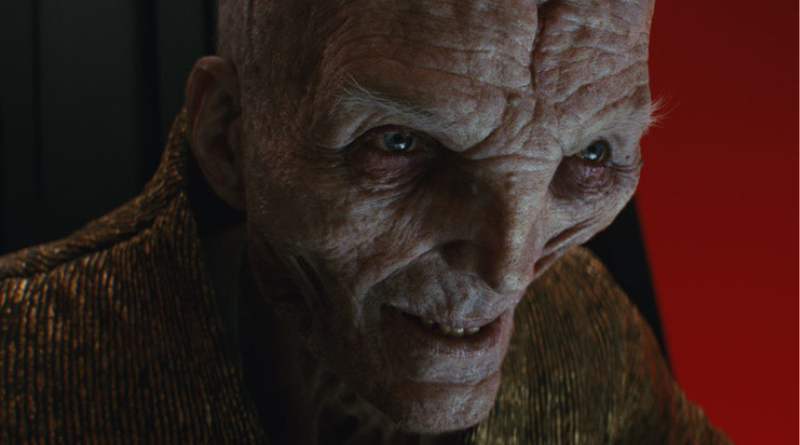 FINALS: THE AGE OF SNOKE! What can really be said about SNOKE which hasn't already been said?! He's THE MOST DOMINANT support character of the meta, and while he might not be as inherently good as Yoda, he just makes everything he touches into gold. He can make bad characters into good characters and good characters into GREAT characters. Whether he is teaming up with Thrawn, Ciena, Bazine or Aphra, he's nothing but formidable, and we'll probably have to enjoy him while we can ... I suspect he'll be in for a bit of nerfhammering pretty soon. At the end of the day it would be Michele Caverzan who would get the upper hand and become the new Italian Champion 2018: CONGRATULATIONS! Watch the finals here courtesy of BAD DESTINY (you even get to practice your Italian a bit)! Interestingly enough in both lists, there are very few of the vehicles that we've become used to as staples in most support based lists, i.e. Fang Fighter, ARC-170 Star Fighter and none of the massive Planetary Bombardment shenanigans, instead relying on sustained Indirect damage to do all the work ... ah, and then naturally the HAILFIRE DROID TANK which is just ridiculously overpowered with DOCTOR APHRA. Being able to play that monster of a vehicle in Turn 1 can be absolutely backbreaking! 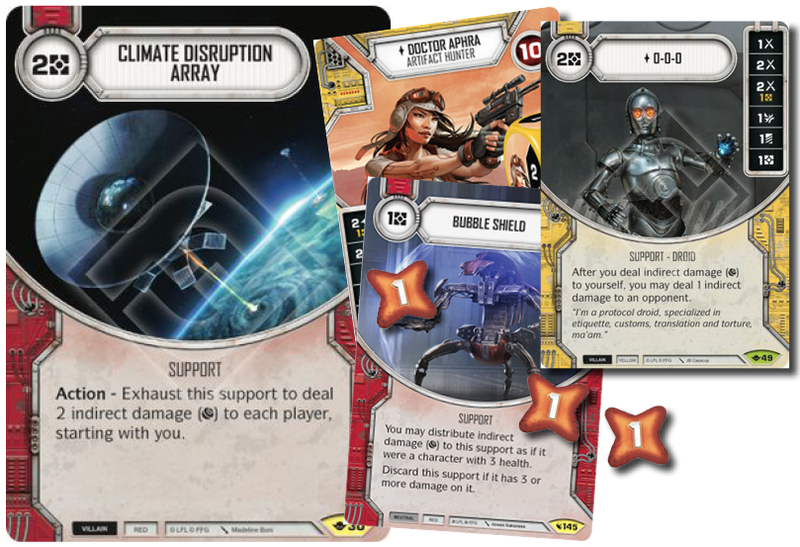 With Doctor Aphra's ability to deal draw cards, and filter through your deck for the quality cards you need, combined with 0-0-0's ability to deal Indirect damage to your opponent, coupled with a BUBBLE SHIELD to soak the damage you inflict yourself ... well ... then you are looking at a locked and loaded nuclear warhead just waiting to explode! Best thing about it: It cannot be mitigated. There are no dice to remove! The question is always going to be if your opponent will be able to outrace you! Most of the cards in the deck gravitates around taking advantage of the combo, including your mitigation suite, and whoever - in the mirror match - gets it set up first will be in pole position to take home the win. SLAVE-1 also looks pretty menacing flanked by BT-1, 0-0-0 and Doctor Aphra. The possibility of removing dice are really manifold with either of the 3 supports, and Slave-1 even comes with a pretty decent die to boot. 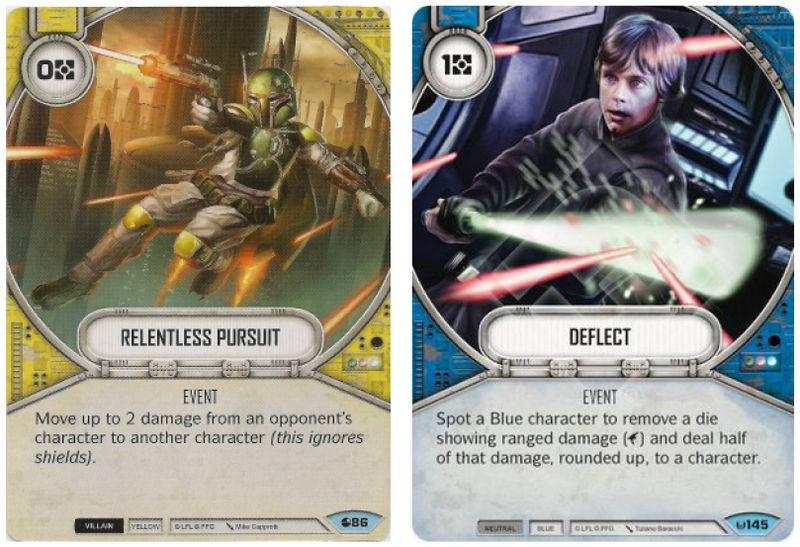 Runner-up Luigi Ravelli added a cheeky tech card to his deck: RELENTLESS PURSUIT to move some of the Indirect damage inflicted, while both of the finalists ran DEFLECT, which now looks like a must-include in the current meta. If you were in doubt before, which you probably weren't, but you are living in an era of SNOKE ... he's here, there and everywhere! CONGRATULATIONS TO MICHELE CAVERZAN - and see you at Worlds 2019! And thank you to Filippo Bosi for keeping us updated on everything that went on in Bologna! 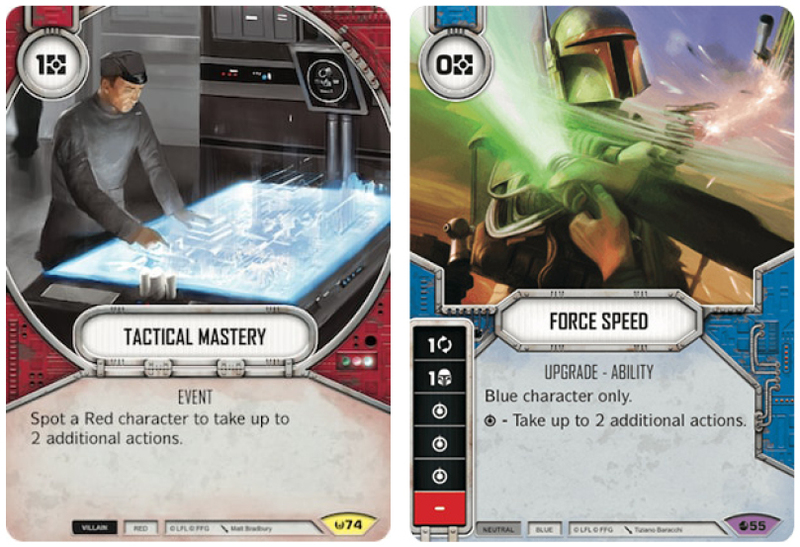 We can now start looking forward to the Spanish and Polish Nationals mid-October and consider if the meta will be moving slightly or if Snoke is going to sit tight on the throne until a new set arrives? !